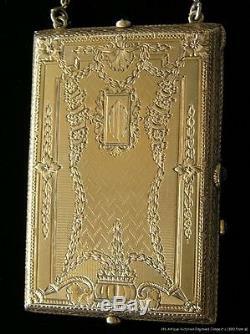 Signed Antique Victorian 14k Gold Engraved Necessaire or Compact with Sapphires and intact mirror. Marked: 14, a W in a circle, CO in a circle, K (see pictures). This mark appears twice, both on the inside "door" compartments of the first two small powder and powder puff compartments. Approximate measurements 3 1/8"h x 2 1/8"w x 3/8"d + 3 7/8" length of chain with bale loop ring. Total weight 114.4 grams. The exquisite engraving is intricate in detail and different on each outer side of the compact. Each of the four cabochon sapphires help to open a "door". The largest side sapphire opens the case to reveal the mirror, and the two smaller powder compartments on the left each open with their own sapphire. The smaller sapphire on the side turns the mirror to the left. Enlarge all of the pictures to see just how fantastic this item is. There is a 1/2"h x 1/4"w rectangular box on the upper front of the case which bears the monogram MTE. All of the closure mechanisms are tight and functional. There are only the very few light scratches as are inherent in any antique gold item. The pictures are enlarged to view the details. The item "Antique Estate Signed Victorian 14k Gold Necessaire Compact w Sapphires c1880" is in sale since Thursday, November 26, 2015. This item is in the category "Jewelry & Watches\Vintage & Antique Jewelry\Fine\Victorian, Edwardian 1837-1910\Other Fine Jewelry 1837-1910". The seller is "ad" and is located in California. This item can be shipped to United States.